Samsung Electronics, a leading mobile phone provider, today announced the launch of its newest full-touch screen mobiles – S5600 and S5230. With these latest products, Samsung is able to enhance its position as a leading player in the hugely popular touch screen mobile market. “Samsung S5600 and S5230 are significant products to our full-touch screen mobile portfolio, bringing stylish designs and intuitive user interfaces,” said JK Shin, executive vice president and head of Mobile Communications division at Samsung Electronics. “We are committed to strengthening our portfolio of full-touch phones by introducing a variety of handsets to suit every lifestyle. These two new products will bring the exciting experience of touch to mobile phone users and will further enhance Samsung’s leadership in the full-touch market,” he added. 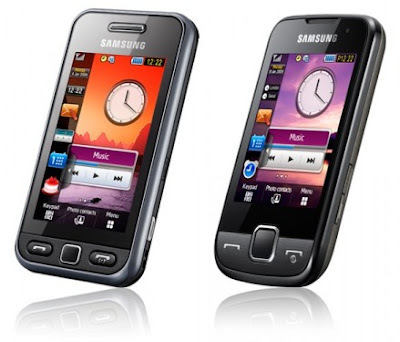 The Samsung S5600 attracts style-conscious users with its slim and compact design. Boasting sophisticated design, the phone is packed with multimedia features that enable its users to enjoy unique mobile experiences. Equipped with a 2.8-inch QVGA full-touch screen, Samsung S5600 adopted the TouchWiz User Interface, designed to customize and personalize the way you use your phone. Mobile widgets can be dragged and placed on the screen for one-click access to your favorite applications. Full Internet browsing support with an accelerometer sensor for auto-rotation also gives users exciting mobile Internet experiences via 7.2 Mbps connectivity. To enhance the usability for touch mobile phones, Samsung adapted “Gesture Lock” feature, which enables the users to unlock the phone and execute the menu directly as they draw a letter of the alphabet on the screen. Users can set which menu they want to correspond to each letter, from A to Z.
Samsung S5600 supports a 3 mega-pixel camera with the latest digital camera features such as Smile Shot. The phone also features music recognition using Shazam’s “Find Music” service. With this service, users can find virtually any song they want to listen to, even at an unexpected moment. By recording and sending a tune to the Shazam server, users can easily track down and even purchase the song through participating operators’ music stores. Multi-codec support including H.263, MPEG4, and WMV eliminates the hassle of file format conversions. The handset’s generous memory (80MB and Micro SD slot up to 8GB) ensures ample storage space for multimedia content. Samsung S5600 will be available in European countries from May. Samsung S5230 comes with the latest multimedia features in a slim and compact body that measures a mere 11.9mm. Adopting a 3.0-inch WQVGA full-touch screen and Samsung’s TouchWiz User Interface with Mobile Widgets, the phone enables its users to enjoy their mobile easily and intuitively. Using “Photo Contact,” users can call a contact by simply touching an appointed image. The S5230 boasts various multimedia features including a 3 mega-pixel camera and video recording supporting QVGA@15fps. It supports multi-format and DNSe for ease of use and better sound quality. The phone also features music recognition using Shazam’s “Find Music” service. To enjoy various multimedia content, S5230 supports 50MB memory capacity with an external memory slot up to 8GB. Samsung S5230 users can enjoy full Internet browsing with an accelerometer sensor for auto-rotation. For convenience, the phone also supports a QWERTY soft keyboard, “Gesture Lock” and handwriting features. Samsung S5230 will be available in France and other European countries from April.